Tricks with Aces have always intrigued the general audience, and a good Ace routine should be at the fingertips of every magician. In his usual inimitable style, Nick Trost has simplified the handling of fourteen such tricks. Look at a partial listing of the effects described in this book: Easy Aces; Flapjack Aces; Instant Aces; Foursome; Ace in Space; Close-up Ace Routine; and Black and Red. Adding these to your repertoire will add to the mystification of your audience. This is the third book in the series on Weird and Psychic Effects, and contains sixty-two additional items that you can use in your spirit seance, spook party or ghost show. If you want your audience to scream for more - or just simply to scream - then present them with some of the effects described in this book. From the effective Three Little Ghosts party pleaser to the gruesome Graveyard Seance, the effects presented in this book will add to your growing list of bizarre effects, with which to thrill your next audience. Additional Weird and Psychic Effects is a plus when it comes to the creation of ghostly, weird and/or bizarre effects for your show. You can call it mindreading, mentalism or new age - but whatever you call it, you will want to read this book! 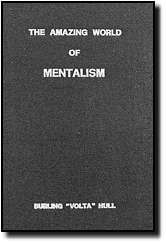 For those who study the human psyche, entertain with mentalism, perform private readings, or deal with the bizarre side of magick, this book is a must! This page is copyright © 1999 - 2004 - All rights reserved.